In case you were busy realizing that you waited way too long to make that Harlem Shake video, here’s what you missed in sports on Thursday. 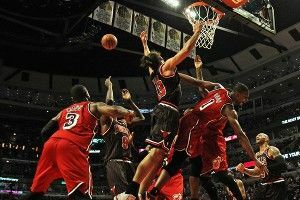 LeBron James powered the Miami Heat to their ninth consecutive win as they beat the Chicago Bulls, 86-67, at the United Center. The game was notable both for James’s performance and a pair of scary moments. First, James pulled up limping after being fouled hard by Bulls guard Nate Robinson. Fortunately, he’s not expected to miss any time. Scarier still, a large lighting fixture fell from the roof of the arena, narrowly missing a group of spectators. While rumors of a “phantom” haunting the arena were quickly dismissed, sabotage by a man envious of James’s success is suspected. Early reports describe the suspect as a bald, 6-foot-6, 50-year-old African-American male wearing a mask over his face and six rings on his fingers. He is reported to have eluded capture using his superior footwork, and remains at large. Top seeds Tiger Woods and Rory McIlroy crashed out of the first round of the Accenture Match Play Championship in Phoenix. For McIlroy, this loss means more uncomfortable questions as his shaky play since switching to Nike clubs becomes a concern. For Woods, this loss means more comfortable questions as his shaky play over the past couple of seasons is a much more pleasant topic of conversation than his personal life. In a relatively tepid NBA trade deadline day, the marquee move sent shooting guard J.J. Redick from the Orlando Magic to the Milwaukee Bucks in a six-player deal. In an effort to process his emotions surrounding his move, Redick, harking back to his days at Duke, composed the following poem. And for some reason, he sent it to me to share with you all. Enjoy! NBA Deadline Day, time to get traded. Am I sad, or am I elated? Unlike Jordan Crawford, who now is a Celt. Look at the truth, and look at the pain. Will they trade J.J.? Are they insane? And what of all the skill that I gain(ed)? My D that developed, my thickening frame? What is the cost for a man like me? Where will I end up? Who will I be? Time to get the call, time to see. No more time, time moved quickly. Milwaukee, for me is a city of dreams. Place in Wisconsin that has lots of teams. Basketball is the game that I play. And also life, I play that game hard. Overcame hardships, been called a coward. Had to spend so much time with Dwight Howard. Seriously, so much damn time with that dude. Guy wasn’t funny, guy was just rude. But enough of the Magic. No more time for stuff that is tragic. No more talk of Dwight. For the Bucks I must fight. God told me to holler. Oh, wait, I guess Buck means deer. A male beast that guys fear. Hoofs on my feet. Antlers on my head. Run too fast, hunters can’t shoot me dead. NBA Deadline Day came and then went. And for me, no doubt, the day was heaven sent.